Raid® Automatic Advanced Insect Control System Do-It-Yourself Expert with Natural Pyrethrins, is designed for continuous protection against flying and crawling insects. Pyrethrins are nature’s own protection against insects, extracted from chrysanthemum daisies. Pyrethrins control most common insects. Read the instructions thoroughly before installing. Choose a location where the air circulates freely and where insects are likely to be. Air changes, building layout, temperature and humidity may affect unit’s efficiency. Turn dispenser off by sliding switch to either off positions. Connect battery to terminal and insert into the battery compartment. Shake can well and then remove protective over-cap from can. Place dispenser on the Raid can. Push down and twist the dispenser slightly until it stops and locks onto the can. Lower the Raid can into the holder and press firmly to attach. Hang product on wall or place on a horizontal surface, preferably 2 metres above floor and at least 30 cm below ceiling. Ensure that unit is in upright position during use to be effective. To activate, point nozzle away from you and switch to on position. The dispenser will activate 10 seconds after switching to the on position. 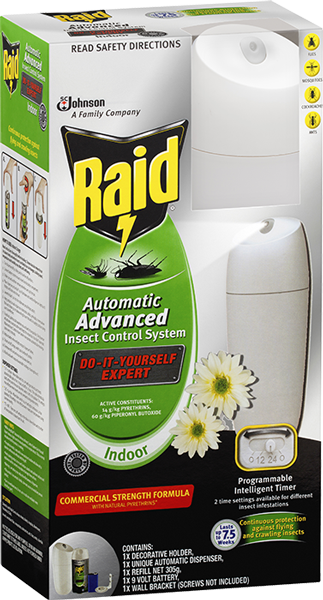 Your Raid Automatic Advanced Insect Control Indoor System now operates automatically releasing a spray every 7 minutes. Replace battery when red light on top of dispenser flashes. To turn unit off, simply switch back to either off position. To remove refill can turn in counter clockwise direction. Wash hands with soap and water after handling or cleaning the unit.